Unless you've been living under a rock, I'm sure you've heard all about Pokemon Go!, the new app that allows you to relive your childhood fantasies of becoming a Pokemon Master. The app takes users all over in search of PokeStops, gyms, and rare Pokemon. And, I gotta say....I love it! Not everyone does, however. There have already been plenty of news stories about people getting hurt and breaking numerous laws in quest of the ultimate Pokemon capture. And then, there's the memes like this one above. Actually, this is a rather nice meme in comparison to some of the REALLY condescending memes made and shared by people who not only avoid the game, but feel superior to anyone who does play. I think this particular image is rather interesting though...because I do both. And, as I found out this weekend, you can do both ALMOST at the same time and at the same place! 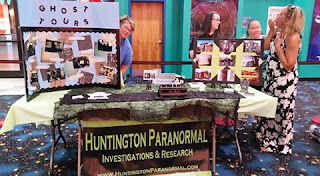 On Friday evening, HPIR attended the premier of the new Ghost Busters movie at Marquee Cinemas in Pullman Plaza. 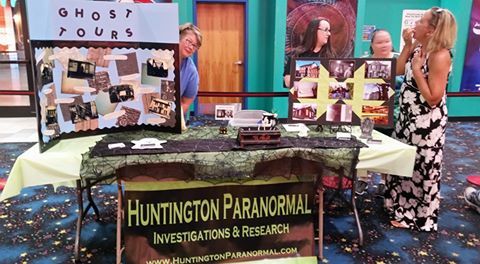 We were part of a promotional meet and greet for the film's opening, and had a wonderful time meeting other groups and talking to the public. Marquee Cinemas is also a PokeStop, so every five minutes or so, those with the app could reap the benefit of collecting some additional balls and items. We even caught a few Pokemon! After the premier a few of us weren't quite ready to go home yet...so we did some impromptu ghost exploration at a popular cemetery in the area rumored to be haunted. We stayed at the cemetery less than 2 hours and encountered multiple cars and hoards of roaming walkers, all in search of Pokemon. And, for good reason. This cemetery had 20+ PokeStops within its boundaries. Seriously, I had never seen so many people in one cemetery at the same time, not even for a burial. *It's loud. I did a quick EVP session at one of the legendary tombstones in the cemetery. Not only is the audio tainted with my own, 'I caught another Eevee!' commentary, but I also picked up the voices of OTHER Pokemon players who were flocking to the area because of a lure that was set off. Oh, and the traffic...picked up traffic noises, too, lol. Photographic data was tainted as well. In a few of my pictures, you could clearly see the glow of a stranger's cell phone, which could easily be mistaken for something anomalous. *When a Pokemon shows up, its enough to set off sensitive equipment, such as a K-II. In fact, most smart phone notifications and updates will sett off equipment, which is why during a formal paranormal investigation, we would never actually have our phones out and turned on. *And speaking of having phones out and turned on, it is rather difficult to observe and concentrate on potential paranormal stuff when you're more excited about the CP of the 50th Weedle you've seen that night. It's also hard to observe and concentrate when there are so many other people around you. *Not everyone is on-board with the idea of hunting Pokemon in cemeteries and similar places. Some believe it is very disrespectful, and a few places, Arlington National Cemetery in particular, have put a stop to such activities. 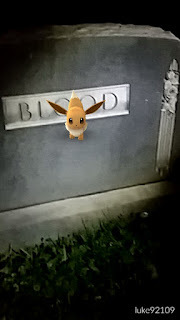 If you are in a cemetery for ANY REASON, especially ghost hunting or playing Pokemon, please remember to be respectful. If requested to leave, do so quietly, and be aware of any local laws or ordinances that may affect what you're doing. *Speaking of laws and ordinances, most WV cemeteries, whether posted or not, close at dusk. The cemetery we visited is a county owned location that is popular among walkers and joggers at all hours, so I think they are a little more lax when it comes to enforcing that particular piece of WV code. However, please keep in mind that local law enforcement might not be as forgiving in smaller or more rural cemeteries. Again, if you are asked to leave, do so IMMEDIATELY without fuss, and if there are NO TRESPASSING signs or if the entrances are gated, do not attempt to enter the area. *Keep safety in mind. 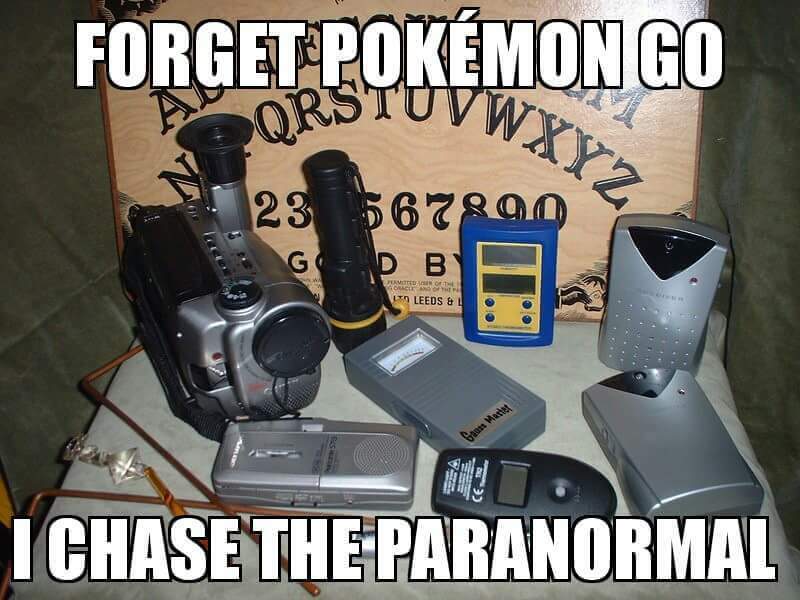 You should never ghost hunt alone and you should never Pokemon Go alone, either. Be aware of your surroundings and the other people who might be around. There are already reports of being getting hurt and/or being mugged/attacked while out playing. Let someone know where you're going and when you'll be back, and always bring a friend along. It's more fun that way! *In summation, I don't necessarily recommend playing Pokemon Go AND ghost hunting at the same time...and I sure don't recommend playing the game during any formal investigation. There are lots of great Pokemon Stops at or near places with a haunted reputation, but its probably best to keep the two interests separate from each other. It's also in your best interest to remember a few key points: use common sense, be respectful at all times, and be aware of your surroundings. I like to hunt ghosts, but I'm not ready to become one yet, and I'm certainly not ready to investigate any Pokemon Go related deaths! Be careful out there and have fun!